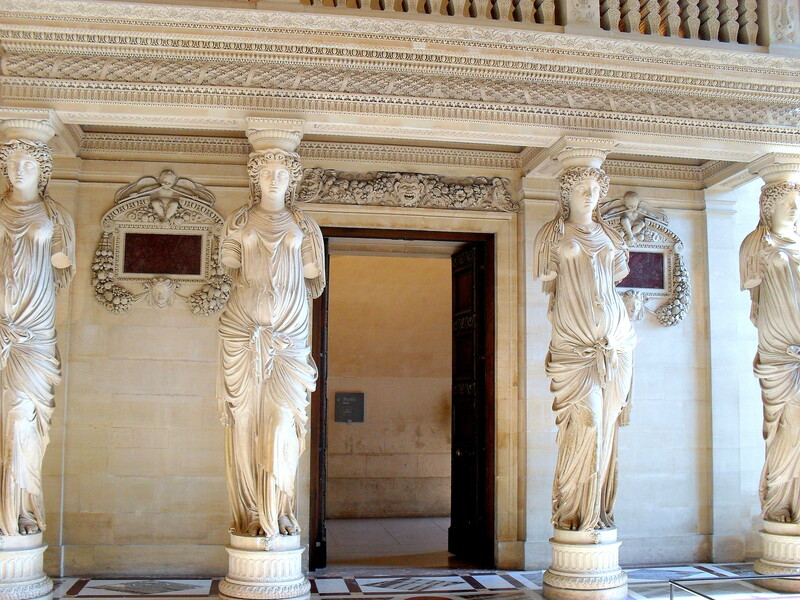 These formidable caryatids support a minstral’s balcony in the Louvre. On the ground floor of 16th-century Renaissance wing of the Louvre designed by Pierre Lescot is the Salle des Caryatides. It takes its name from the four beautiful female figures which were sculpted by Jean Goujon in 1550 as surprising supports for a musicians’ gallery. This light filled repository houses Roman copies of Greek originals, many of which are stunningly beautiful and a few which are frankly disturbing, such as the reclining hermaphrodite who really should have been more particular about his/her/its draperies. They are perfect, like the shot! Just curious, do you know why they are armless? Fair enough. At first glance, I thought they’d been damaged, but the missing limbs looked so uniform from statue to statue it made me wonder if they’d actually been carved that way in the first place. If so, I’ve got to wonder why.